Omega-3 DHA provides both mom and baby with a concentrated form of DHA for fetal neural and visual development. DHA also contributes to mental and cardiovascular health in both mother and baby. 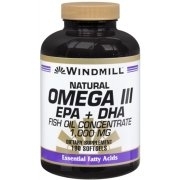 Windmill Natural Omega 3 EPA and DHA 1000 mg softgels is Dietary Supplement. Essential fatty acids. All Natural. For pregnant and nursing mothers, with extra DHA for babys brain and eye development. No sugar, starch, yeast, wheat, milk, soy. Windmill Natural Omega 3 EPA and DHA 1000 mg softgels is essential for Baby and Mom. Take 1 softgel daily as a dietary supplement or as directed by a healthcare professional.